We offer a tremendous breadth of services to our customers, all designed to work together and interact seamlessly with your team. We are a national company with local knowledge and boots on the ground. Our Residential Quality Assurance Program has been developed based on our 20+ years of data analysis and experience. Our services are specifically tailored to ease the challenges you face every day, while providing you transparency and accountability at all levels. Technical Plan Review™ is an integral part of any comprehensive Risk Management program. Quality Built specializes in providing comprehensive, multi-disciplined Plan Review services performed by a team of expert and experienced forensic architects, professional engineers, and code professionals, to identify code and design deficiencies. The only leading provider with an ISO 9001:2008 Certified Quality Management System. 80% of our clients voluntarily choose to work with Quality Built – Confirming Our Value to Builders! The Quality Built software solution features reporting on all open items. The power of the platform is its ability to coordinate and report to stakeholders, project managers and superintendents simultaneously -escalating issues per your compliance metrics. Quality Built is the ONLY quality assurance company that provides ratings on trade performance on a continual basis. Quality Built uses a proprietary, algorithmic scale – weighing each checkpoint’s structural risk, installation complexity, and quality of work to arrive at a performance rating. Ratings provide Superintendents with the information they need to clearly communicate and illustrate trade performance – enabling trade partners to perform targeted training. Promote collaboration, transfer risk, prevent delays, and promote continual improvement at all levels. Quality Built can have you up and running in no time. You will be guided by our industry experts every step of the way and have access to our wealth of knowledge and innovative, proprietary solutions. Necessary project information is collected from the builder in order for us to provide accurate Third-Party Quality Assurance practices. Click here to access form. Customized project templates are created and accompanied by accommodative scheduling, relevant checkpoints, and trade worker engagement. Training is included for project managers, superintendents, and trades on the QA process – communicating the open item closure process, and the essence of maintaining roles and responsibilities. Data is reviewed every 90 to 180 days and any recommended changes to the program will be presented to the client. Leverage the innovation and expertise of Quality Built as we create and implement a customized internal quality assurance program for your company or automate your existing internal QA program. After understanding the key information about your project and current systems and processes, Quality Built will train your designated employees to perform the QA inspections. 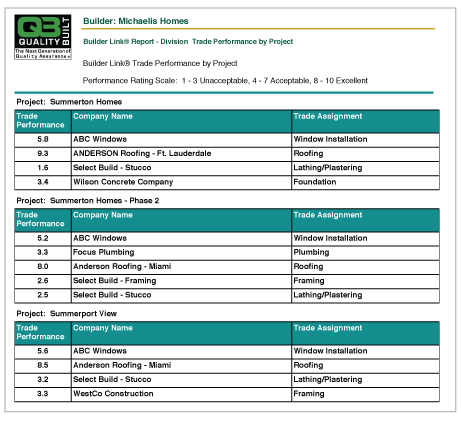 QB Builder Link is a secure, client-friendly, construction reporting program that efficiently captures construction data and QA processes. It is the same program utilized by our Field Consultants conducting traditional Third-Party QA. When combined with a virtual or on-site inspection program, Quality Built’s simple-to-use QB Builder Link becomes a powerful Quality Assurance and documentation program that costs just a fraction of what other QA systems cost. In keeping up with our commitment to help you produce a superior product, Quality Built provides fit and finish inspections, conducted with the same level of knowledge, expertise, and detail as our quality assurance inspections. Fit and finish inspections should never be rushed. We ensure the proper amount of time is spent to verify the details of the home will meet or exceed homeowner expectations. Whether you are measured by J.D. Powers® or your own internal scoring system, you can improve ratings by reducing punch list items identified by your homeowners. Utilize Quality Built’s digital documentation and HomeID® – a homeowner inventory tool, at no additional cost. HomeID®: The Preferred Method for New Home Profile, Management & Documentation. HomeID is a centralized, cloud-based, secure on-line application for homeowners. Moreover, HomeID allows builders to easily implement increasing popular “customer for life” programs, maintaining contact with home buyers long after the new home sale is complete. HomeID is a 2014 PCBC Parade of Products Award Winner! Here at Quality Built, we provide extensive knowledge and advanced services to our builders. These include QB HomeBuilder Risk Assessments™ , Forensic Services, ASTM Water Testing, HOA Turnover, Product and Material Inventory and Tracking, and Geotechnical Services. In addition, our knowledge base is one of the largest libraries available in the industry. Please click below on our Advanced Services or Education Support and Training buttons to learn more.